One of the key indicators of the health of a modern society is the longevity of its citizens. Because of improvements of medicine there has been over many decades a general decline in the death rate of all demographic subgroups. It is therefore unusual, perplexing and a sign of trouble when the morbidity (illness) and mortality (deaths) of a part of a population violates this trend. However, according to Princeton University economists Anne Case and Angus Deaton deaths of white Americans aged 45 to 54 are increasing, instead of decreasing. Drug abuse and alcoholism show up prominently in the statistics as can be seen from figure two from their paper. Poisonings related to drugs and alcohol have risen sharply to be the number one cause of death. 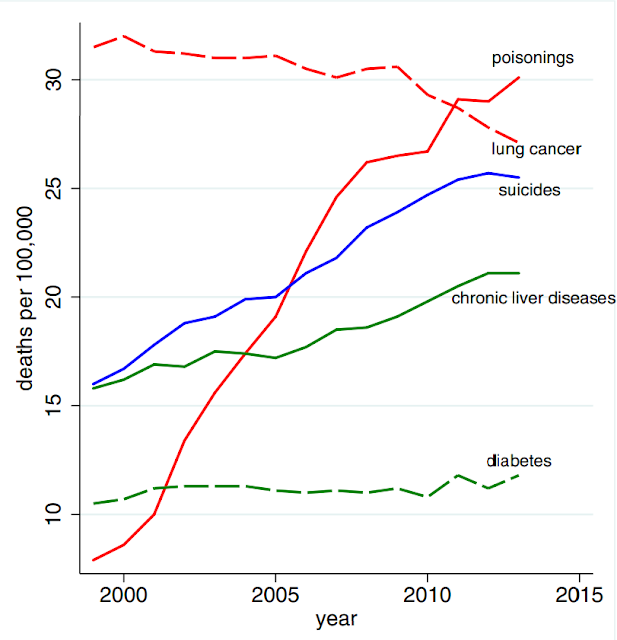 Deaths from suicide and liver failure that are linked with drug and alcohol abuse are also prominent and rising. Overall, this paints a very serious and distressing picture of this group of Americans. Education seems to play a significant role in these results. 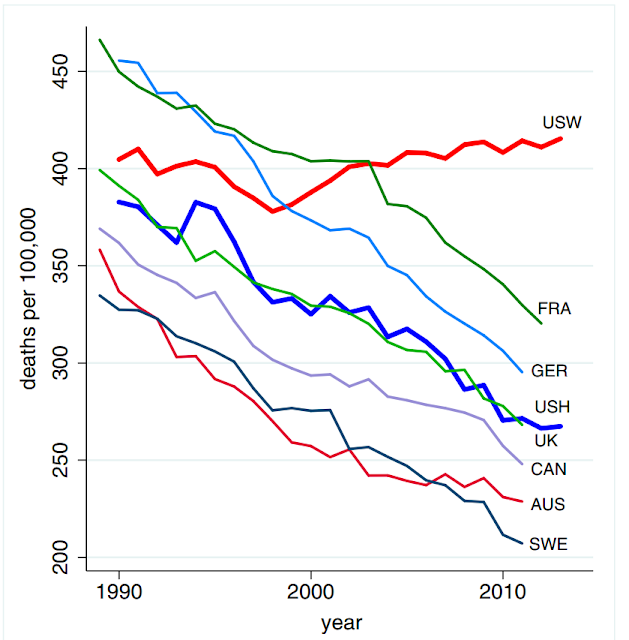 Separating white middle aged Americans by education level shows that only that those with a high school education or less have seen a rise in overall mortality. Those with some college but less than a bachelor’s degree have had a small decrease and the largest decrease is from those with a BA or more. Education, once again, seems to inoculate individuals from serious social harm while at the same time providing an overall benefit to society.